Shoulder Separation: An AC Joint Injury (Video) - Jeffrey H. Berg, M.D. A shoulder separation is a common and very painful injury. Fortunately it usually heals completely without surgery. Let’s take a look at what it is, how it occurs and what’s the best method to treat it. The main shoulder joint is supported by a number of associated muscles, ligaments, bones and even other nearby joints. One of these joints is the AC joint. The AC (Acromioclavicular) joint is made up of the Acromion (the “A”) and the Clavicle, or Collarbone, (the “C”). This joint is a rigid joint on top of the main shoulder joint. It is held together by a number of ligaments. Due to it’s location, it’s lack of flexibility and the fact that it is relatively exposed since it is not surrounded by much muscle, the AC joint is very susceptible to injury. 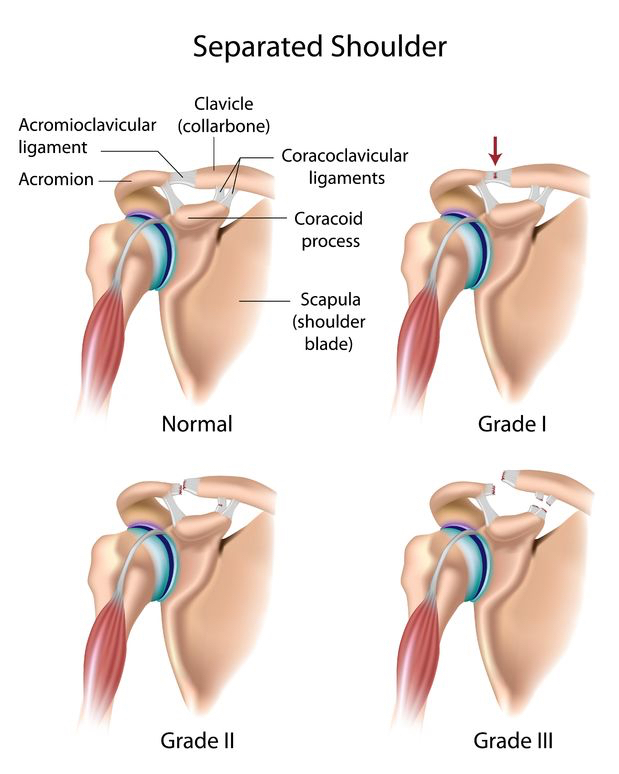 An AC joint separation is just that, a partial or complete separation of the acromion from the outer end of the clavicle at the AC joint. This occurs when the ligaments that normally hold the joint together are sprained (partially torn) or completely torn. Most AC injuries occur when someone lands or is struck forcibly onto the top or side of their shoulder. These injuries commonly occur during a quarterback sack in which the injured shoulder is driven into the ground or when a hockey player is forced into the boards. 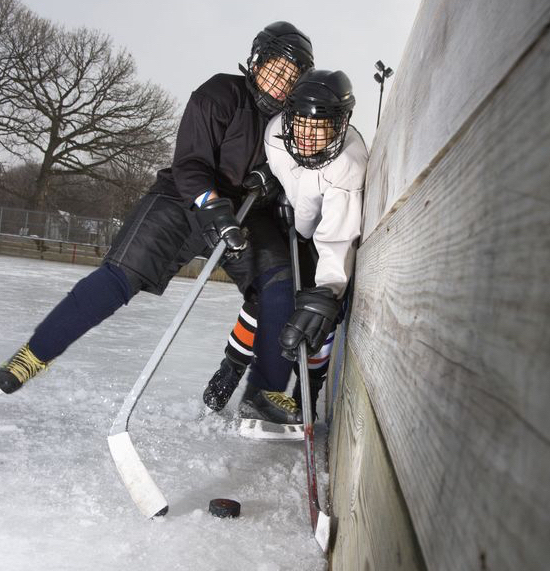 They can occur, however, in nearly all sports including recreational sports or activities such as skiing, biking or boogie boarding. If you separate your shoulder, you’ll know it right away. These injuries are very painful. The pain is immediate and significant. It is located on the top of your shoulder at the AC joint. People who sustain a shoulder separation usually are unable to lift their arm due to the pain. Frequently swelling develops on the top of the shoulder. It is also common for the nearby skin to turn “black and blue” as well. You may even notice a deformity of your shoulder. When this occurs, there will be an apparent bump at the top of the shoulder in the area of your pain. This is actually the end of your collarbone, now prominent do to the rest of your shoulder drooping some. Fortunately most AC injuries can be treated without surgery. Since the common symptoms from this injury can be similar to those that occur when you break the end of your collarbone, it is a good idea to get an evaluation. An X-ray and a doctor’s assessment, is therefore recommended when this injury is suspected. Shoulder separations are graded based on the severity of the ligaments’ injuries as well as injury to the surrounding soft tissues. As mentioned previously, most AC injuries fall into this group. Even if there is a deformity of the shoulder, without surgery, full, painfree function can usually be expected. Initially, the treatment consists of ice to reduce the swelling and numb the pain. Pain medications and rest, usually in a sling are also typically advised. Once the pain is tolerable, usually 1-2 weeks after the injury, a therapy program to restore shoulder range of motion, strength and function, is recommended. With this treatment, most can expect significant improvement within 2-6 weeks of their injury. Full recovery for older or more active patients can take 2-3 months, however. Surgical treatment is rarely needed. It is reserved for those injuries that have significant and specific radiographic deformities. The surgery is not an emergency and is often best done after the swelling and initial severe pain has improved. During the surgery, the torn ligaments are either repaired or reconstructed from other tissues. Additional means of holding the AC joint aligned (sutures, pins and screws, etc.) are also often used. Full recovery from surgery can take as much as six months and often requires a fair amount of post op physical therapy to be achieved. Shoulder separations are common and painful injuries. Fortunately, they can usually be successfully treated without surgery. Because the symptoms of a shoulder separation can be similar to other more serious injuries and because some do require surgery, it is always a good idea to get an evaluation by an Orthopaedic sports medicine surgeon when you suspect that you have sustained this injury.